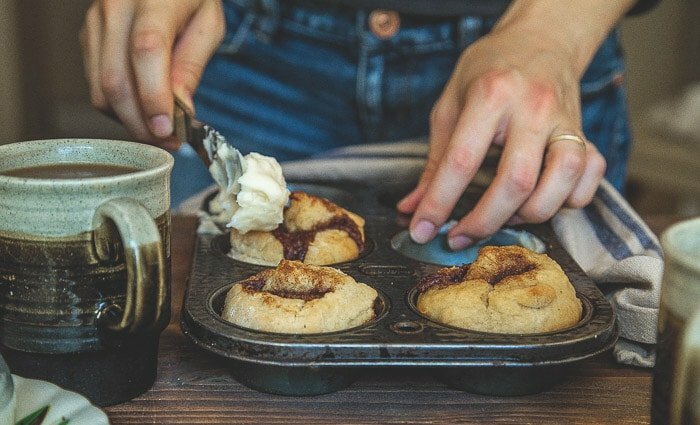 Cinnamon rolls for two, made so quick and easy without yeast! I’ve had a lot of no yeast / quick cinnamon rolls in my day. And, um, most of them are not much different than a biscuit with cinnamon sprinkled on top. But these babes? They’re baked at a much lower temperature than most other recipes. They also have a much higher concentration of butter than most. But, good news—I figured out the secret to marriage: sharing a half-stick of butter with your partner as often as possible. We don’t need no stinkin’ marriage counseling. We got butter! You need a regular muffin pan for this recipe–this is my favorite pan. I love darker muffin pans because they encourage browning in muffins. Also, I love that it only has 6 cups, because we’re into this small batch lifestyle, aren’t we? Ok, I’ve officially used throngs of women to convince you how much you need small batch cinnamon rolls for two in your life. The hardest part of this recipe is remembering to take the cream cheese out of the refrigerator to soften while you bake. But just so you know, if your fridge is fresh-out of cream cheese, you can use this glaze from my potato cinnamon rolls. Other than cream cheese, you should have everything to make these cinnamon rolls for two in your pantry. Dangerous, right? I trust you, though. You can have this recipe, and do with it as you please. I’m not here to judge your small batch cinnamon roll consumption levels. Get ready. Your weekends will never be the same. In a small measuring cup, combine the milk, vinegar, and 2 tablespoons of the melted butter. Combine the brown sugar, cinnamon, and remaining 1 tablespoon of granulated sugar. Press this mixture lightly into the butter on top of the dough. Carefully, roll the dough up starting with the long side. Roll away from you. When you get to the end of the dough, pinch the entire seam shut. Meanwhile, beat together the softened cream cheese and powdered sugar. If it seems hard to spread, splash in some milk or heavy cream. Frost the cinnamon rolls when they come out of the oven, and serve. So fast, easy, yeast-free, and yes, have everything on hand to make them! Pinned! giiiirl these could be dangerous. can’t wait to try them! So fast and easy- I’m seriously considering making these right now, they look much better than my bowl of cheerios for breakfast! Um this is a dream come true!! Totally pinning and making ASAP! These are so pretty! What a treat for a Saturday morning. I need to conquer my cinnamon roll fear this weekend. My fav part? It only makes 4, so I won’t turn into a hungry hippo! Yes please!! These look heavenly!! Oh – these ARE dangerously delicious…and with a small batch recipe..no reason NOT to make these every weekend! YES TO SMALL BATCH. I made cinnamon rolls the other day…and then I ate them all. Which was terrible and awesome. These complete me. Pinned! I wish I could reach through my screen and grab one of these to enjoy with my coffee. Pinned! My mind is still blown that these do not require any yeast! Thank you for this recipe! Hellooooooo lovers. I will meet you Saturday mornings for the rest of eternity! I love these small batch recipes! I need to do more of these because I always have too much! OK, I have to tell you. . I love the photos with hands and people in them. . love it! Adds so much more and is like telling a story. . and if that’s you in the shot, who took the lovely photo above? Oh. My. Goodness. These can not happen soon enough. Also, l’m drooling. Oh my gosh! I am in love with these!! Not only because of the small batchness, but also because there’s no yeast!! Totally making these! The only think I would add is a bit of orange juice to the frosting as that’s my husband’s favorite combination: Cinnamon Rolls with Orange Glaze. I can’t believe I’ve never made it for him. You have inspired me to change that! Ok…I’m making these this weekend. My husband is an absolute fiend for cinnamon rolls, and the fact that these don’t take hours and hours to prepare have me completely sold. Plus, they look AMAZING. My husband has been working some pretty crap hours and I know he’d love coming home to a couple of these. And I just happen to have 4oz of cream cheese in my fridge that I’ve been trying to figure out how to use. Score! This kills meeeee <3 cinnamon rolls. There is nothing like a cinnamon roll but this is even better since it is quick. Would love to start a Saturday morning this way. I can’t wait to make these! About how wide should the rectangle be? Wow–these seem too good to be true. I’m definitely intrigued and will be trying these before too long. Gah!! These are TOTALLY my kind of cinnamon rolls! Love the recipe! Christina, these seem like a dream come true! You betcha I’m trying this on a weekend morning very, very soon. Um yes. I will definitely be making these this weekend! Holy cow!!! Only 4…this could be dangerous knowledge for my hips!!!! Weekend? How about TODAY?! I can get along with a quick cinnamon roll recipe any day of the week. I seriously, seriously want to eat a cinnamon bun every single morning for the rest of my life. This recipe looks absolutely perfect! Totally obsessed with these! Love how you scaled these down for the perfect amount. and no yeast? even better! Looks like the best way to keep a relationship together to me! Yes!!! I love a good yeasted cinnamon roll but hate the wait and then of course the left overs! I end up eating cinnamon rolls for days. Not that there is anything wrong with that it is just I never do enough working out or eating of green things to balance it out. Sooo needless to say I am super pumped about these!!! You are a genius! 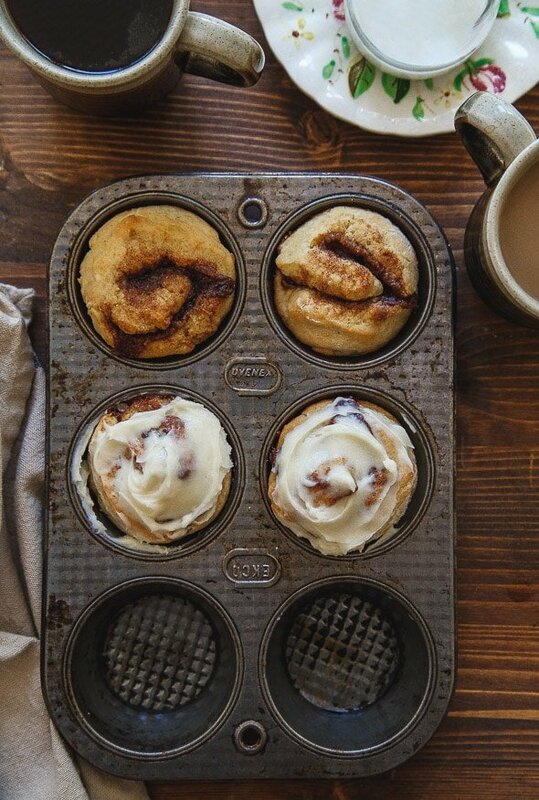 My weekends need these cinnamon rolls! Ohhhh, this is dangerous information!! I should have never never never read this blog. I do not need to know how to make quick and easy small batch of cinnamon rolls. Yes, I pinned it. Yes I am going to make it probably this weekend. We will never be friends. You temptress! My sister and bro-in-law are visiting from Texas this weekend. You’re going to make me look like a rockstar. A rockstar with a broken ankle and ugly black boot, but a rockstar nonetheless. Yum! I like adding grated apples to my cinnamon rolls; they take it to another level of moisty-goodness and are a great substitute for much of the sugar! I am not a huge fan of no yeast cinnamon rolls but these look pretty darn tasty! I love everything about this! Your photos are just so pretty! These – I NEED this in my life!! And I love the photography, beautiful work. This is amazing! I hate having extra baked goods around the house for obvious reasons, but have been craving cinnamon rolls lately. I will be making these this weekend. Thanks! Everything that I need to be happy in life, ever? It’s all right here! I love cinnamon rolls and made this recipe today with my 3-year-old baking helper. While I love the simplicity of this recipe my rolls turned out to be the texture and consistency of biscuits with a yummy cinnamon middle. Did I make them incorrectly? They still satisfied our cinnamon roll craving but weren’t exactly the texture I thought they’d be. You made them right as far as I can tell. I just made them myself, but I figured they’d be biscuit-esque considering there’s no yeast. Still damn tasty. Cud I sub buttermilk for the milk and vinegar? OMG. These look SO good. I have to make these ASAP! Not to be negative, but I would like to read ratings of your recipes AFTER people try them. THANK YOU SO MUCH. 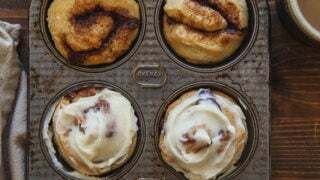 I LOVE CINNAMIN ROLLS SO MUCH AND WILL MAKE THEM THIS WEEKEND. got to make these today. hi Anna :) Cupcake size in a regular muffin pan. These are so dangerous! I made them so fast and they are so so incredibly good. The worst part? I doubled the recipe and I might eat them all … I’m doomed. I just made these and shared them with a roommate and friend. They were such a joy to make and SO DELICIOUS! I substituted lemon juice for the apple cider vinegar and they turned out to be a little small, but the texture of the rolls were still very light. I plan to be making these again in the future! I made these this weekend for me & my stepdaughers, they were so yummy. They tasted just like rolls i buy at the grocery store. The only problem was i didn’t make enough of them. Thank you! Idea: use browned butter instead of melted butter. It would give the rolls a richer, nutty flavour. I’ve just made these, and I have to say they are amazing! The dough is so soft and easy to work with, and so quick to make too! I did struggle to roll the dough up though but I think that was just because it’s such a small batch. Next time I’ll bake them for slightly longer too, but other than that they were delicious. I love this! Thanks for posting.. I will be making these for hubby and me. Also, I love the mug in your photo!! Stumbled across these on pinterest and we loved them! The husband would love to eat cinnamon rolls every single day. And this makes that more possible;) After looking around your blog I realized that you’re living in St.Louis, our city! Have you found any good cinnamon rolls around here? We’re always regretting that there are none. Except Sweet Art. Thanks for your beautiful site! Thanks so much for the great recipe! These have become a Sunday tradition. They are delicious and so, so easy! It’s because they’re not true cinnamon rolls made with yeast. They’re always going to err on the side of biscuits instead of rolls because without yeast, it’s a leavener-raised dough. I can work on a true cinnamon roll recipe with yeast for you. Many have made these and liked them, but I understand the yeasty-flavor you’re looking for. Made these this morning as my two boys were begging for cinnamon buns and there was no Pillsbury to be found. Loved them! Never looking back, so YUMMY! 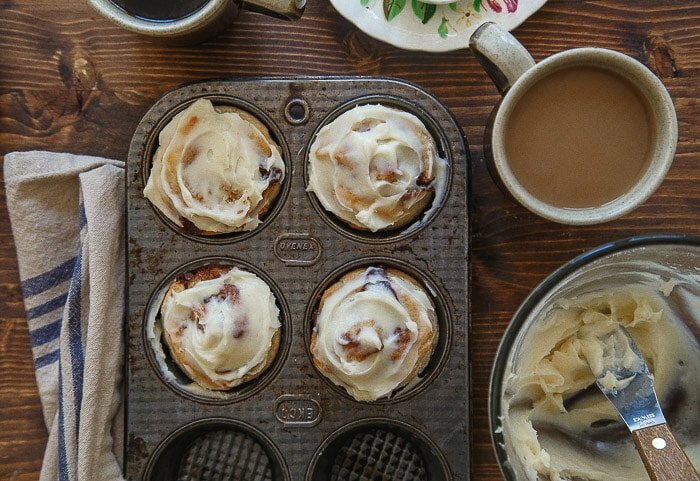 Totally does what it says on the tin — quick, easy, delicious cinnamon rolls. I actually liked that they’re a little more on the side of biscuit-y things than the squishy cinnamon rolls made with yeast. Absolutely perfect on this snowy Sunday morning. The only thing I changed was to play with the frosting a bit — I added closer to 1/2 cup powdered sugar, a splash of vanilla, and a tiny pinch of salt. I just love the whole concept of this blog, small-batch baking — it was great to know I could make these for myself and my husband without fretting over having way too many left over. Thanks! Vinegar – does it need to be apple cider or can I use white? Also – is the vinegar to simulate buttermilk or to help with the rise? You can use white. Yes, it increases the leavening action. Just made these. They were quite good for a cinnamon roll fix. They did, however, as others have said, have more of a crumbly biscuit texture. But, hey…when you want something quick and in limited supply, these are great! great recipe for a quick treat. Love that ingredients are kitchen staples. Will definitely be making these again. We just got another 20″ of snow and sooo needed some warm comfort, these are perfect. Thanks! I’m sorry, Sally. I do not provide calorie counts. It would be too depressing for all those involved ;) Try googling a site where you can type in ingredients and get an estimate. I don’t know of a good one, but I’m sure you can find one. I am embarrassed to say how many times we have made these since I found the recipe. They are delicious! My son and I made these quickly for Sunday morning breakfast. Our muffin pan has 12 smaller spaces so we went for “More is Better” and cooked them for 10min. They were yummy and quick. Perfect way to start our day together. Thank you. Thank you for your recipies, as I recently became Empty Nest, and need to only make enough for the 2 of us. Already being addicted to sugar is a bad place to be if there’s half a pan of _____________ (whatever) left in the house alone with me!! I made these this morning, but realized after I went to pour the butter on the dough that I’d used a weird shaped stick of butter and melted 8 tablespoons…and had already but 4 in the dough. Ooops! Suffice to say, they were very very rich. I added some chopped nuts to the filling and made a simple citrus glaze…will definitely make them again, correctly this time! I made these and they were amazing! Totally loved, and I just doubled and tripled the recipe for more people. For those of you who aren’t good at kneading or patting out the dough ( I’m not either), try flouring some wax paper and working the dough on that, it’s a lot easier to clean up. Thank you for this recipe! Thanks for the “no yeast” cinnamon roll recipe! Amazing! Thank you for helping me have cinnamon buns without needing to go to the store for yeast! I found the texture to be just like the delicious “two bite rolls” I love to devour. Perfect easy small batch recipe. I just made these. Looking at my finished product, it didn’t look as good as the pictures here, but they tasted very good. Very quick and easy. Thanks. I’m making these right now…literally ready to go in the oven. Is the cooking temp really 375 degrees? You wrote, “These babelicious rolls are baked at a much lower temperature than most other recipes.”, so I am confused as most of the other recipes out there call for 350 to 375. Any help would be appreciated :) MERRY CHRISTMAS! It really is 375, as written. What texture should the dough be after it’s patted out? I took the instructions very literally and just spooned the batter onto the floured surface. Needless to say, I found rolling and handling it difficult. Should I add more flour to start or knead in flour into it isn’t sticky? Hi Cathy! Yes, add flour until it’s dough-ish. It should need only a couple tablespoons more to become work-able in your hands. I made the cinnamon rolls for two but didn’t come out looking like yours at all hmmm, the only difference I made was acv I had to use vanilla extract instead tasted amazing but crumbly and small. Amazing tho!!! Hi, if I could, the acv acidifies the the milk to make it more like buttermilk. This will also react with the leavening agents to help with rise. Vanilla adds flavor and not much else. Some argue that the alcohol in vanilla can make things more dense too. Hope this helps! I just made these tonight! They are delist but I think next time I’ll add a splash of vanilla to the dough, have you considered doing that? Can you use white vinegar instead of apple cider vinegar? I think so. Not sure…sorry! Just found these and they have changed my LIFE! Only changes I made was using only brown sugar (I’m out of white!) and my frost in was with powdered sugar, milk, butter, and vanilla. The texture was perfect and I couldn’t believe how quickly I was able to whip them up. THANK YOU!!!! Loved these. Easy to make and ingredients are usually in pantry. Will have to double the recipe for my growing boys though. These were really good!! The perfect amount for two! My husband really liked them! Thank you for this great recipe! OMG STAWP. These are amazing! Bring the cinnamon sugar high on! Love your writing, love your site, love your cinnamon rolls, love you! I think that just about covers it…XOXO! Hi! Stumbled on your recipe from Pinterest :) My daughter has Celiacs and I was wondering if you’ve talked to anyone who substituted the all-purpose flour with a GF flour blend. My son’s birthday is tomorrow and he is BEGGING for cinnamon rolls so I’m trying to find something to make his day, but keep his sister safe, too. Hi Erin! I haven’t tried this recipe with gf flour, I’m sorry! But I’ve heard really good things about the ‘cup 4 cup’ brand of gf flour. Very good! Thank you! I only made some minor adjustments – I added more powdered sugar in the glaze as I like it sweeter, and I also added a dash of vanilla. Otherwise – it’s a great recipe! Made these today and they are amazing!!! Thanks for the recipe! I don’t know what I did wrong, but they turned out really weird! I did everything according to the instructions, but the dough turned out really dry. It didn’t want to come together at all, so I tried adding more milk, but it didn’t help. I just went with it anyway and baked them, but ended up with them (of course) still being really dry, but also having this really weird bitter taste. Tried these today. Dont know what went wrong but rolls didnt fill cups. Did i need to smush down in cups? Dough wouldnt pinch well to close. My baking powder is dated good for awhile but maybe thats the issue. Im frustrated. I usually dont have problems with baking. Help! Tried these today. Tasted good but did not fill cups. I followed recipe exactly. Also was hard to pinch seams, wouldnt stay shut. My baking powder is good so i dont know what went wrong. Should I have pushed the batter into the cups? These were just AMAZING! The texture was sooooo light and fluffy with a great taste of cinnamon. I will for sure be making this recipe again. This is a REVIEW from having MADE these Cinnamon Rolls… no just USELESS “gonna make it COMMENT’. WOW! They are wonderful… I will do this again & again. And 4 rolls is just perfect for the Two of us because regular cinnamon rolls lose their wonderfulness after 1 day. Thank you! I used the recipe for the dough to make lil babka swirls! The filling consisted of semi-sweet chocolate, butter, cinnamon, sugar, and instant coffee powder, and it was absolutely DELICIOUS. This is my go-to recipe for cinnamon rolls. I have taken to tripling the recipe for groups. Delish! I just made these today and they were delicious! Grateful it only makes 4 so there’s built-in quantity control. It doesn’t duplicate a real cinnamon roll texture exactly, which was expected due to the lack of yeast, but hits the mark for sudden, instant need-cinnamon-rolls-now cravings (which I get frequently). Thanks for the recipe! These are so beautiful! Definitely wouldn’t mind one (or 12 ;)) next to my cup of coffee now! Gorgeous pictures. I made these quick cinnamon rolls for the super bowl party and it was a crowd favorite. I’m also gonna pin this post on my Pinterest board my followers will love it. Thanks for sharing, Christina! Definitely I will make these quick cinnamon rolls on the weekend for my family. This cinnamon rolls recipe is incredible! I’m seriously so inspired right now. I need to add honey to the recipe and it would be perfect. Thx for sharing! It helps that I just happened to have the icing already made up in the fridge for a cake that didn’t work out. Wow, wow, wow! My husband woke up today, Xmas Day, asking for cinnamon rolls. I quickly told him they take way too long to make but that I would check online for a quick recipe. I whipped these up in a matter of minutes and we both LOVE them. I doubled the recipe for leftovers. Highly recommend! Very well done!!! Yummy! Can i use oat flour to substitute for the white flour? I haven’t tried that gluten free substitute, so I’m not sure. I’m sorry! Good luck! Can you add xanthan gum to your oat flour? Omg this was a really great recipe, the process was quick and easy. The outcome was even better, it was a perfect ratio and brown sugar and cinnamon, absolutely loved how the cinnamon rolls turned out. Definitely recommend trying this recipe on a free day! Just made these, took 30 minutes and tasted DELICIOUS!! !